One of the disappointments of the continuing debate over contraception is the failure of Catholics who don’t accept the Church’s teaching to acknowledge the existence of a serious and persuasive rational argument that the Church is right. Either these people don’t know of the argument’s existence—although it has been around nearly half a century—or else they don’t feel up to replying to it. Neither explanation is greatly to their credit. The problem this presents could get worse in the months ahead as the Church prepares for two assemblies of the world Synod of Bishops on marriage and family issues. The first will take place next October, the second in October 2015. Fortunately, Pope Francis has made it clear where he stands. 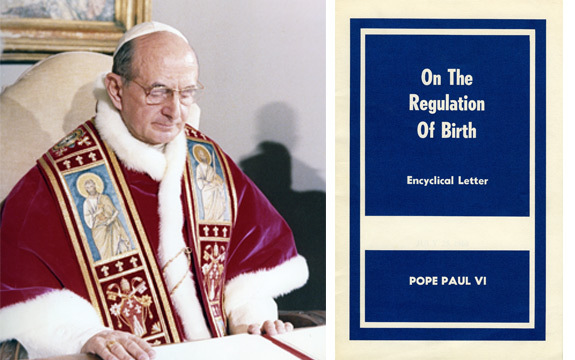 In his recent interview with Corriere della Sera, he called Pope Paul VI’s 1968 anti-contraception encyclical Humanae Vitae “prophetic.” The issue now, he added, isn’t “changing the doctrine” but applying it sensibly. Pope Paul said the same. An instance of the problem I speak of—ignoring a strong rational argument in support of the encyclical’s teaching, that is—is a column last month by Clifford Longley in The Tablet, an influential voice of liberal Catholicism published in London. Longley writes often about the contraception issue from the perspective of those who reject the Church’s teaching. His column is a critique of the “Theology of the Body” identified with Pope John Paul II. Longley says the theory is “defiantly unempirical” and fails to prove contraception is wrong. On the whole, I agree. But it’s not so clear the Theology of the Body was intended to prove anything. Its aim, rather, seems to be to shed light on sexuality in a way that will help people understand sexuality more deeply. Someone open to what it says may find that helpful in understanding the wrongness of contraception, and that’s all the theory claims to do. Besides the Theology of the Body, however, there’s another approach that does indeed make a rational argument against contraception—an argument Longley and people like him sometimes appear determined to pretend doesn’t exist. It’s the “New Natural Law Theory” developed over the last half-century by thinkers like Germain Grisez and John Finnis. Briefly put, its case against contraception proceeds along these lines. The outline—the blueprint, you might say—of the human capacity for fulfillment is found in basic human goods. These are the fundamental purposes for which human beings choose and act. Moral good and moral evil reside precisely in how we choose to relate to them. Obviously it isn’t possible always to pursue all of them. But it is possible—and of the essence of moral goodness—that one never directly choose to act against any. Yet someone who understands what he or she is doing in an act of contraception unavoidably wills and acts against the human good of procreation, though very likely with some other good in view. And that, very briefly, is why contraception is wrong. Instead of pretending this argument doesn’t exist, people who believe, and wish others to believe, that the Church’s teaching against contraception is mistaken need to come to grips with it.